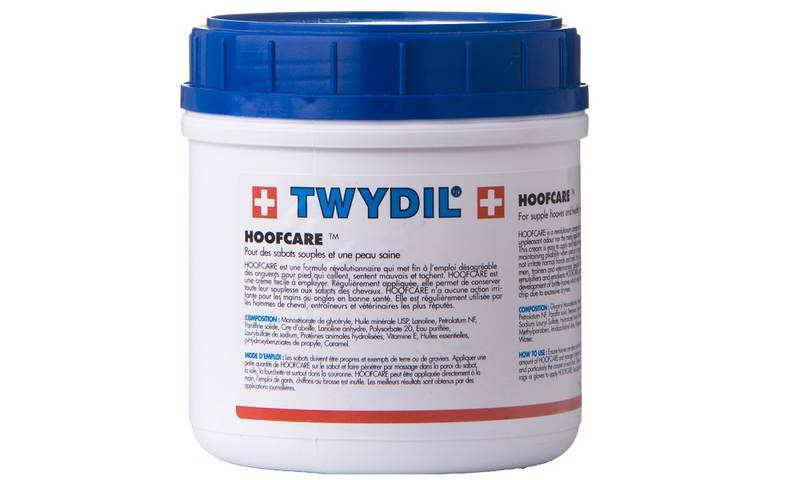 Twydil Hoofcare is a cream that encourages natural hoof growth, it can also be used on horses suffering from mud fever or with superficial skin lesions. For dry, cracking or flaking hooves, clean & dry the hoof, then apply to the hoof wall, sole, frog & the coronet and massage in well. In cases of saddle sores, girth chafes; superficial skin lesions; redness & splits of the pastern fold, simply clean the affected area, then apply directly. Use Twydil Hoofcare daily for best results. Ingredients: Vitamin E, beeswax, lanolin, Spirulina extract. Twydil Hoofcare stands out amongst its competitors, as it has Spirulina in it. Spirulina contains a number of beneficial polysaccharides & pigments, which are thought to have antiseptic properties. It also helps to improve hoof growth by stimulating the coronet cells; this is why, when you are applying Twydil Hoofcare, you should make sure you apply it to the coronet band as well as the hoof itself.